Creating a database from scratch consists of adding the necessary objects one at a time. To create a database from scratch, start Microsoft Access and click Blank Desktop Database. The categories are organized vertically, as columns. They are also called fields. A field is an object used to host, hold, or store a piece of information of a database. The fields of a table are used to store data. The group of records of a table is called a record set. On the left side of its top section, a table presents an icon . The table icon provides a menu you can access when you right-click. When a table displays with a tab, the extreme right section of the tab(s) shows a close button you can click to close the table. When you click OK, you will be asked to close and reopen the database (which you should do). The cell is actually the object that holds data of a table. From the Fields tab, you can make selections. A table must have a name. There are two main ways you can specify the name of a table, either when you save it for the first time or if you decide to rename it. If the name of the table reflects a combination of words, such as Bank Accounts or Students Academic Numbers, you should start each new word with an uppercase. Here are examples: tblBankAccounts, tblStudentAcademicNumbers, tblMemberRegistrations. You can create other object and they will have their sections. Each section is expandable and collapsible. To expand a section, click the header of that section. To the same to collapse a section. To let you get some information about a table, Microsoft Access provides a dialog box that allows you to know the name of the table you are accessing as well as the date and time when it was created or modified. Any of these actions causes the table to display in Datasheet View in the central area of the screen. When a table is displayinig in Datasheet View, in the Views section of the Ribbon, the View button displays the Design View button . To close the table, click its Close button . To rename a table, in the Navigation Pane, right-click the name of the table and click Rename. In each case, you will receive a warning to confirm. Therefore, before deleting a table, make sure you really want to get rid of it. When in doubt, do not delete it. A table does not exist without a column. If you start a table in Datasheet View, Microsoft Access creates and gives it one default column. Once a table displays in Datasheet View, you can start entering data into its cells. If you do this, whenever you enter data under a column, that column receives an incremental name: the first column on the right side of ID would be named Field1, the second would be Field2, and so on. You can give meaningful names to the columns of your table. When any cell under a column has focus, on the Ribbon, you can first click Datasheet. Then, in the Fields & Columns section, click Rename Column. Any of these actions would put the name of the column into edit mode. You can then type the new desired name or change the existing name. To actually create the table, you must execute the code. There are three kinds of fields or cells the user will face: a field in which the user can type data, a field that displays a list as a combo box the user has to select from, and a field that does not receive input from the user. After setting the data in a particular field, you can click another cell and type the desired data. The table-name attribute must be the name of an existing table of the current database. If the name is wrong, the SQL would consider that the table you are referring to does not exist. Consequently, you would receive an error. The VALUES keyword indicates that you are ready to list the values of each field of the record. The values of the columns must be included in parentheses. When you execute the code, you will receive a message that you are about to add a record. Read it and click Yes. If you double-click, the column would be resized to the widest value of the column, provided the widest value is wider than the column header. If the widest value is narrower than the column header, the Field Width would be widened enough to display the name of the column. Instead of manually resizing a column, you can ask Microsoft Access to take care of that. To do that, right-click a column header and click Field Width. In the Column Width dialog box, click Best Fit. Once the name is in edit mode, type the desired name and press Enter. To hide one or a group of columns, you can right-click and click Hide Fields. To hide a column, clear its check box. To reveal a column or a group of columns previously hidden, right-click any column header on the table and click Unhide Column. In the Unhide Columns dialog box, put a check mark on each column you want to show. Any of these actions would present a warning to confirm whether you still want to delete the column(s). Mostly you, the database developer, have access to the Design View of a table. The user will hardly, if ever, use that view. To work on in a section, using the mouse, you can just click. To switch from one section to another, press F6. 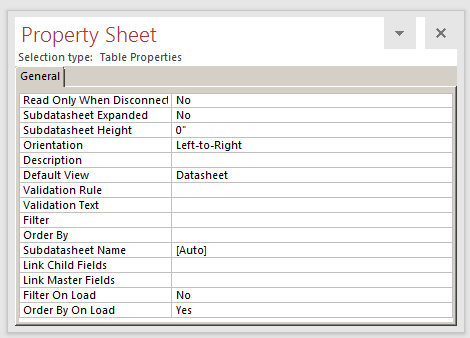 To display the Property Sheet of the table, right-click any part of the table in Design View and click Properties. A data type represents the kind of information that a particular field should, would, or must hold. Microsoft Access provides all the types or categories of values necessary for a database. To make your database efficient, in some circumstances, or depending on the project (or customer), you should exercise as much control as possible on data entry. This aspect is mostly controlled at two levels: tables and forms. Type a name for the column. After creating a column, if you want to change it, on the Ribbon, click Fields. 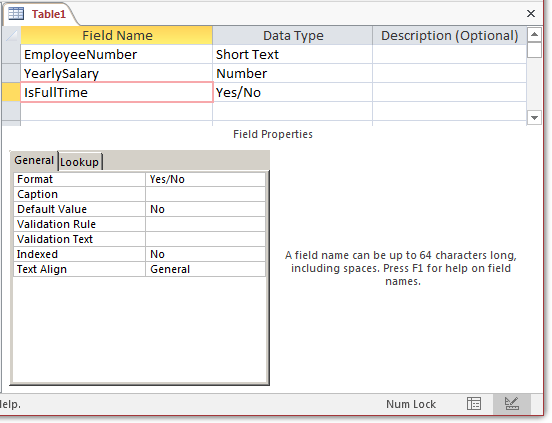 In the Formatting section, click the arrow of the Data Type combo box and select from the list. To further control how data is entered in the database, you can configure a field's characteristics. To rename a field in Design View, click it and type the new name. You can delete a column or a group of columns of a table in Design View. To get rid of a column, right-click the button on its left and click Delete Rows. The ALTER TABLE and the DROP COLUMN expressions are required. 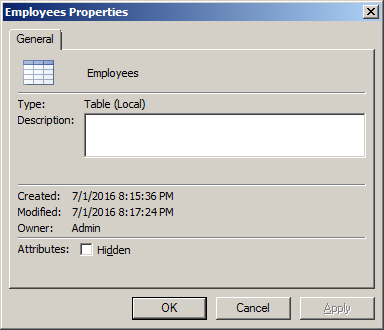 The table-name is the name of the table that holds the column you want to delete. The column-name is the name of the column you want to remove from the table. The table-name parameter must be a valid name of a table of the current database. There are two significant issues with the DROP TABLE command: it does not warn you and it is not reversible.